A folk festival in New York City you ask? The Brooklyn Folk Festivals is now in its 11th year, and is hosted by The Jalopy School of Music and Theatre. It is also the city of New York's only folk festival. Of course, as many of you know, New York City was once the epicenter of the Folk Revival and used to host numerous folk festivals back in the day, but it's been some time since the 60s folk scare and those towering folk superstars of yesteryear Bob Dylan and Joan Baez. What really makes this festival unique is its emphasis on traditional music and its respect for artists both old and new. Also at the heart of the festival is revivalist John Cohen (New Lost City Ramblers). Cohen is a well-respected musician, documentary filmmaker, photographer and recorder of rural Southern music. Acknowledged as a central influence on Bob Dylan and others during he was involved in bringing rural Southern music to city folks in the 1960s. Arriving at 7.30pm the opening night had an atmosphere both pensive and frenetic. The buzz was palpable. I caught the melliferous tones of the Ukrainian Village Voicesthough somewhat lost in the kerfuffle of the opening night. Their customs were eye catching and added to the diversity of the evening's music. Their music is primarily vocal and instrumental music from the rural Ukraine. As the evening progressed Jackson & The Jankshit the stomp box and loaded the evening with R&B from New Orleans. I then had to run upstairs to the workshop room to host, present and perform my own segment on the Ballads of James “The Rooster” Corcoran. As I entered into the fray of Saturday, The Mammalswere taking to the main stage to provide a healthy dose of folk and original songs, and some fine tailoring. On the parish stage John Harrodwas performing eastern Kentucky fiddle syncopations for the fine flatfootingCity Stompers. The temperature was set for The Hayrollersto tear it up with some high-lonesome bluegrass vocals and some fierce fiddling by fiddler Bruno Bruzzese. In the afternoon, I excitedly headed upstairs to hear about folk music impresario Izzy Young and his impact on the folk revival in Remembering Izzy Young and the Folklore Center. The panel was moderated by my old buddy, and blues aficionado, Scott Barretta. The discussion took from personal recollections and Tulsa bound archival material to present Izzy as the conscience of the folk revival with his participation in the 1961 Washington Square riots (there's some Youtube footage on this). Izzy's encounters with Bob Dylan are the stuff of legend, and many did not see his initial potential as John Cohen quipped some saw him as " a Woody Guthrie knock off." Izzy moved to Sweden in the late 60s as he became enamored with traditional music there. Izzy’s friend's John Cohen, Peter K. Siegel and Matt Umanov where also joined by archivist Mitch Blank who was sporting a Rolling Thunder Review denim jacket which certainly warranted mention. There was also a small selection of photographs and memorabilia from the Folklore Center that is being curated by Mitch. Onward and upward as I entered into a special screening of American Epic. A new documentary "featuring the untold story of how the ordinary people of America were given the opportunity to make records for the first time." The first artist of which was one of my own personal favorites Mississippi John Hurt. It was great to see and hear new footage of Hurts, and to hear him being interviewed at the Newport Folk Festival of 1964 with the sounds of Bob Dylan performing 'Tambourine Man' echoing in the background. Ironically Hurt is talking about what the new interest in folk music means to him as an elder statesman. He quotes the Bible by saying he is impressed that there is an interest in what the older folks have to say. The final segment of the movie brings together the technology of the past with artists of the present with Jack White performing, hosting, and leading folks through live performances of traditional sounding tunes. The technology was somehow the star as it hummed away in the next room. An incredible example of engineering as the weight hit the floor to end each recording within a 3min period of time. That's where the 3min song standard was conceived. You know you've been at a festival when you cannot cover everything that is going on, and your appetite has truly been wetted. I had to be very selective at times and decided that I needed to hear more about Alan Lomax from archivist curator Nathan Salsburg. He was certainly up for the task in his presentation that spanned the years before and after Lomax's 1959 “Southern Journey.” Its legacy 60 Years on is still really only now beginning to reach the mainstream public in terms of its scholarly importance, as he documented folk and traditional song performances fro the US, Europe and further afield. Hi Southern states recordings used the state of the art stereo tape machine, as Lomax was a keen observer of technology changes and used them effectively in his collecting. Lomax made the first ever recordings of now-legendary figures like Bessie Jones and Mississippi Fred McDowell. Recordings of work songs at Parchman Farm and the thunderous hymnody of the Sacred Harp were essential to the folk revival, and Lomax's legacy still inspires today. 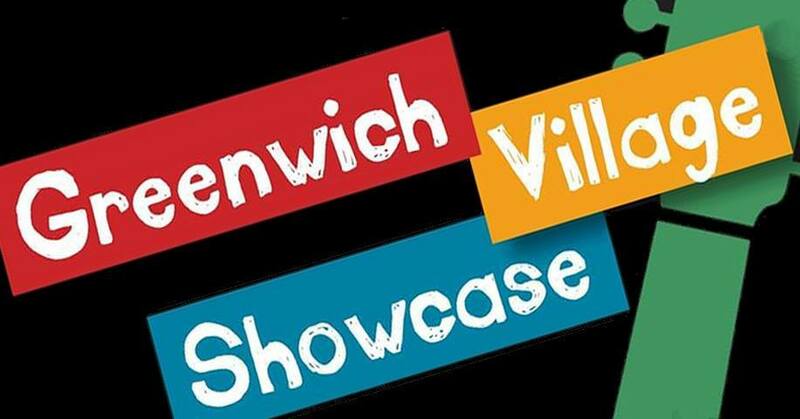 It's hard to believe that it's nearly two years since I performed at the Peoples Voice Cafe. 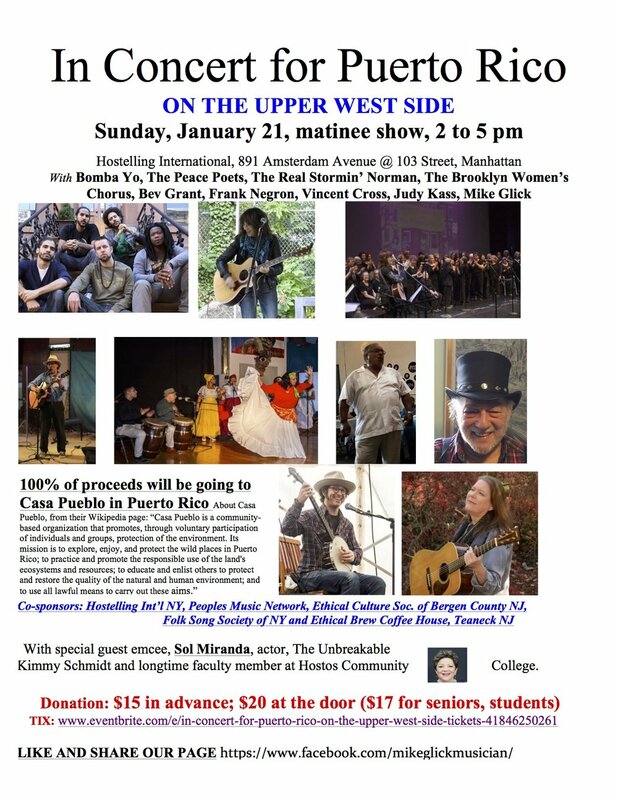 Celebrating 40years of live music it offers an alternative music experience in New York City, from folk music and protest songs to rap, jazz, poetry, storytelling, and dance. I'll be sharing the night with Lindsey Wilson & The Human Hearts a singer-songwriter with a flair for nostalgia and a memorable mix of 70s-style urban folk rock and conscious lyrics. Cafe entrance at far right of building, at street level. All shows start at 8 PM, Saturdays. Doors open at 7:30. No reservations, so come early to be assured a seat. $20 suggested contribution -- more if you choose, less if you can't; no one turned away. For PVC subscribers, students, and youth, the suggested contribution is $12. Wheelchair accessible (including bathrooms). For info call 212-787-3903. Arriving at the beginning of April is the ever popular Brooklyn Folk Festival, which is presented by the Jalopy Theater and School of Music. Each year I have a a fabulous time hanging out watching shows, catching old friends and even participating! This year I'll be performing some horrid little ballads about James “The Rooster” Corcoran and will be joined by Erica Mancini (accordion) and Shane Kerwin (bodhran/whistle). We’ll be upstairs in the workshop room, and start at 9.30pm. It's opening night so come at 7.30 and catch everything! The debut of The Life & Times of James "The Rooster" Corcoran took place in the intimate setting of the Fireside Lounge in LIC, NYC. It was a capacity house, and if you scrowl down you can click on the short film clip that has three edited tunes from that night. Thanks to Sam Harmet for bringing down the camera and setting it up. No film of the second night has surfaced yet. The first tune, "A Man After Me Own Heart" is taken from the 1899, New York Times article entitled:"JAME CORCORAN IN COURT: RULER OF CORCORAN'S ROOST GOES BAIL FOR A MAN AFTER HIS OWN HEART." The other two clips are well known 19th century tunes, "The Lakes of Pontchatrain'" and "Hard Times." As you can tell people were in fine singing form and that fire place was cosy indeed. Come and hear newly composed & arranged broadside ballads about this 19th Century Irish-American truckman, gangleader & squatter colony chief. My 5-times great-grand uncle! James "The Rooster" Corcoran was known for his "caustic tongue and ready wit," and was often stereotyped tabloid fodder for the newspapers of the 1800s. If you've ever seen the movie Gangs of New York, then this would be a musical accompaniment to the rogues, pimps, murders and thieves that inhabited New York City in the 19th century. DETAILS: * Both shows have a suggested donation $15 (no one turned away). Way back in May we had the last New World Folk Club get together, and it was a sweet evening of tunes and talent. Hilary Hawke sang beautifully, and clawed her way through some Old-time banjo classics with Christian Apuzzo sharing his heartfelt bluegrass compositions. We covered some ground over the course of the afternoon folks. Bringing these fine talented folks together over the course of the year was a real pleasure, and I must thank the Folk Music Society of NY for co-sponsoring. Also, the Scratcher for hosting. This summer I found some wonderful musical moments to share with you folks. The first event was held at Lincoln Center and was hosted by the Center for Traditional Music and Dance, which was celebrating its 50th anniversary with a fine lineup of heritage artists including West African Sidiki Conde & Tokounnou, Afro-Colombian traditional band Grupo Rebolu, and Cherish the Ladies representing the Irish musical tradition. Sidiki was stricken with polio as a boy and has reconstructed dance steps using his hands instead of his feet. You can read more about him and his music on his website here. As the humidity bore down on us the Afro-Colombian traditional band Grupo Rebolu hit the stage with firey enthusiasm that had folks up and dancing in front of their seats to the infectious beats. These folks perform a monthly residency in Teraza 7 in Jackson Heights. You can check out more about them here. Representing the Irish tradition, Cherish the Ladies charmed the audience with their friendly banter and Irish dancers. I wasn't able to stick around for Andy Statman and his Klezmer Ensemble, as I wanted to catch George Ward at the Waterfront Museum in Red Hook for some 19th songs about the Erie Canal. All part of the research behind my own project on James J. Corcoran. Finally, Safia and I had the extreme honor of hearing Mavis Staples perform her soulful classics. Wow! She encored with "The Weight," which was truly amazing to hear. Her voice seeming to come from some deep place still sounded charged and ready for fight, and folks responded with an encore. I bumped into Rick Massimo of I Got a Song in a nearby Thai restaurant at the 2017 Brooklyn Folk Festival. We chatted about our folk passion, and I attended his workshop in which he presented a lively discussion about the changes in the folk landscape extending back to the 1960s and as any good folkie knows the Newport Folk Festival has some serious historical value when it comes to how the public perceive folk music. As the major folk event of the 1960s the Newport Folk Festival is usually remembered as the moment when the darling of the folk world Bob Dylan went electric. Of course there are many myths to the event, but the politics are still raw today, and any book about the folk revival cannot ignore this moment as the commercial world taking a bit out of the folk apple. Questions still abound about the why and how the result of this moment and few books penetrate the surface of the debate, but many must at least attempt it. I Got A Song is a fascinating read as it both educational and entertaining. Two terms that seem inseparable to what a folk event should never forget, but in some part seem to missing from how it's being managed today. Some parts of the book I skipped over, such as those that went into the minutiae of the relationships of the various memory agents and bookers who control this platform. Other parts are very revealing in unexpected ways as Jim James, a regular performer now, waxes lyrical about what the festival symbolizes, and I couldn't help but notice that he is also on the board for selecting artists. I'm sure this is problematic in more ways than one. Tickets sell out fast these days, and it has become fashionable and successful, and as the book explains there is a new audience now as some of the old folks seem to dislike successful things. Really? Maybe that'd like to go to something that is less commercial? Maybe more educational? Maybe you should have a read yourself and let me know you thoughts. Thanks Rick Massimo for taking on this difficult topic and providing us with grist for the mill. It can be hard to put a finger on what is really hitting the musical spot at any one time, and it's only by habit that I notice what is hitting my turntable regularly. I take a conscious effort to make sure I know what music enters my waxy eardrums, and will not suffer poor musical choices without some kind of face pulling. I listen to vinyl mostly as I really enjoy the ritual of selecting the record and listening to whole piece. Though listening to music is far less of a thrill than playing it, I still notice the difference in the experience of playing a CD or MP3 to spinning a record. The recent unearthing of NA FILI 3 in a old bookstore in Athlone over the Christmas was truly an epiphany for me, but one that was a long time coming. Having lived in Ireland for most of my life, I was not always able to get my head around traditional Irish music. The music seemed to come from some other time, and the songs and music seemed to be separated as accompaniment, especially by guitar, was not encouraged. Not being an instrumentalist but a singer I was left wandering into American folk styles, which seemed more open and also more relatable to the popular music of the times. Living Galway for many years I could not help discover young players with great passion and energy who were completely absorbed in Irish Traditional music; Harry Bradley, Dereck O'Shea, Declan Corey, and Jon Hicks (Gan Ainm) were the folks I followed around and looked up to and hassled and admired though I felt completely separate from them, I was in awe of how they played together, and I remember sessions in Mick Taylors Bar in which they played acoustic instrumental music that mesmerized my eardrums. Here's a discovered link of a show they did in Iceland that really does capture some of the ambiance and energy. So that's sort of the round about introduction to the album I'm listening to right now. It spins and spins and I just keep listening. I feel it's all there. Everything I every wanted to know about Irish traditional music: The songs, the airs, the laments and the passion. I just hope some of it rubs off on me. Here's a clip of the boys playing that I hope you'll enjoy. The New World Folk Club is set to run its final show on Saturday afternoon, May 26th, so if you've not managed to get to any of the great shows we've had this last 5 months, then now is your last chance. The two very special guests this month are Hilary Hawke (banjo/vocals) & Christian Apuzzo: (guitar/vocals). Hilary Hawke, is a banjo/multi-instrumentalist, and teacher based in Brooklyn, NY. 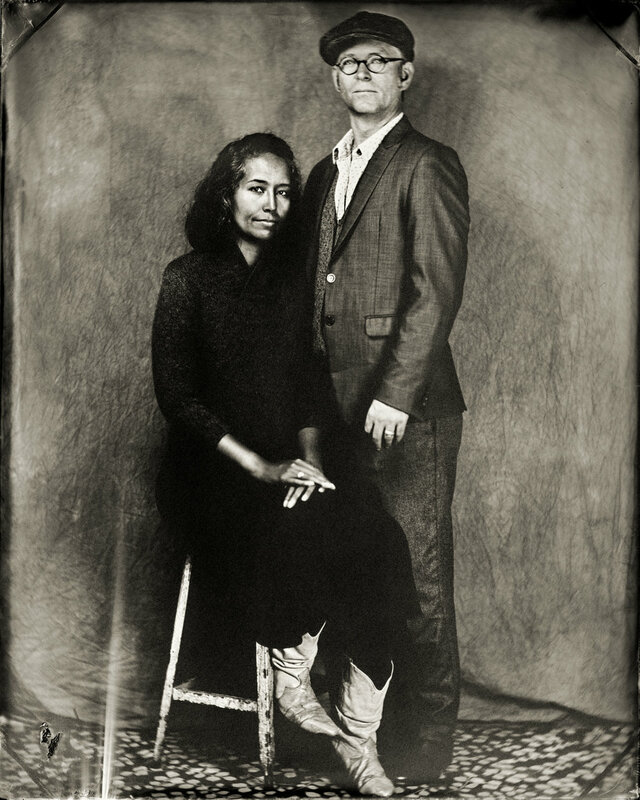 She plays banjo in Brooklyn based bands; M Shanghai Stringband, Dubl Handi(the Wild Goats), the Dead Sea Sisters, and she plays upright bass with Hopalong Andrew and with Chapin Sisters full band. Christian Apuzzo, is a New York based guitarist/singer and educator who specializes in bluegrass music. You can catch him around town in various formations including, but limited to: Bluegrass Collusion, JCAM Country Band, Cole Quest and the City Pickers, and other concoctions. The New World Folk Club is a new intimate and educational folk music event on the last Saturday of each month at the Scratcher Bar, NYC. Hosted by Vincent Cross, two special guests are invited to collaborate on traditional and/or contemporary folks songs. Guests this month are Andres Jimenez (mandolin/pipes/vocals) & Naomi Sturm (guitar/vocals). 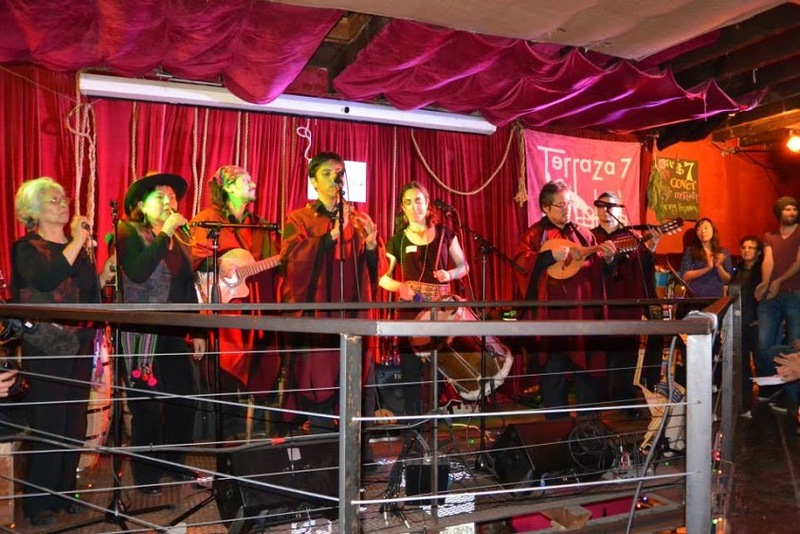 They will be joined by a special guest for the second set to really give you a taste of Andean Folk Music. Andres Jimenez, is a multi-instrumentalist, composer, and musical director of Andean folk band Inkarayku based in Queens, NY. Over the years he has apprenticed and recorded with many of the New York area Andean music greats such as Guillermo Guerrero, Pepe Santana, Carlos Ambia, Walter Aparicio, and Jose Alberto Ruiz. He is well known and respected for the flexibility and precision of his performances with the traditional groups Tahuantinsuyo, Inkay, Wayramarka, Grupo Khana and Sumaq Punchau respectively. Naomi Sturm, is a New York based folkorist who specializes in music of the immigrant experience. She initially joined Inkarayku in 2011 as the group’s manager and producer, and as a performer she blends this knowledge with that of American roots music, the Anglo-American ballad tradition, and East European folk melodies. Arriving at the beginning of April is the ever popular Brooklyn Folk Festival, which is presented by the Jalopy Theater and School of Music. Last year I had a wonderul time hanging out watching shows, catching old friends and even participating in a workshop by Jan Bell about topical and political songwriting. This year I'll be hosting my own workshop on tradigional songwriting, that delicate branch of songwriting that is both traditional and original. Here's a link to the full schedule (LINK), but I'd like to recommend that you check out Bruce Molsky’s Mountain Drifters – Old time string band on Saturday 4:30pm. He has a 2:00pm Old Time Fiddle Workshop that will be well attended too. Also, at 4:00pm check out the film Linefork a documentary on legendary KY banjo player Lee Sexton, followed by Q&A with the filmmaker. Yes sir! On Sunday, I recommend you have listen to Thomas McCarthy at 4:15pm for some unaccompanied ballads from Ireland, and then at 5:00pm Pat Conte – Blues, gospel and old time songs and tunes. These two back to back will be an amazing contrast. On the evening show you can't got wrong with The Down Hill Strugglers w/ John Cohen at 7:00pm with some Oldtime string band sounds, then 8:30pm Michael Daves & Chris “Critter” Eldridge for some Bluegrass duets!. I've not seen Pokey LaFarge , but at 9:15pm he'll be picking some original, blues and folk songs! What a weekend!! The New World Folk Club is a new intimate and educational folk music event on the last Saturday of each month at the Scratcher Bar, NYC. Hosted by Vincent Cross, two special guests are invited to collaborate on traditional and/or contemporary folks songs. Guests this month are Sam Harmet (mandolin/clarinet) & Erica Mancini (accordion). Sam Harmet (LINK) is a mandolinist, composer, improvisor, and music educator based in Brooklyn, NY. He can regularly be found performing with the Walter Thompson Orchestra, Karl Berger's Improvisers Orchestra, Mob Job, Erica Mancini, and other various jazz, klezmer, and experimental groups. Erica Mancini (LINK) is a Chicago-native born to Argentine parents who moved to New York City in 2009. She has performed in jazz bands, marching bands, gypsy jazz ensembles and other original and world music projects such as French reggae, original folk music from the Dominican Republic, and traditional Bavarian polka music. Before the Christmas I was in touch with Brian Lofthouse (LINK) a master instrument builder who now resides in Co Mayo, Ireland. The plan was to see if he might be able to make a cross between an Irish bouzouki and Gibson mango-cello- a tall order indeed. The results of this experiment have finally been unleashed upon the world, and I cannot be happier with this interesting hybrid. Take a look at the process of construction below and the final outcome. Check out the images below to see the evolution. I'm very excited to share the news that the project The Life and Times of James "The Rooster Corcoran has received a grant from QAF New Works, which is funded by the New York City Department of Cultural Affairs, Greater New York Arts Development Fund. The project is to write a new collection of songs about this colorful Irish character who moved to NYC in the 1840s, and who I seem to be related to (LINK). An underground figure who was known as the King of the shantytown in his time, and is referred to in Gangs of New York. Stay tuned folks! The New World Folk Club is a new intimate and educational folk music event on the last Saturday of each month at the Scratcher Bar, NYC. Hosted by Vincent Cross, two special guests are invited to collaborate on traditional and/or contemporary folk songs. First guests are Gene Yellin (guitar) & Clarence Ferrari (fiddle). Gene Yellin, a 40 year veteran of the New York bluegrass scene, has played with Hazel Dickens, Breakfast Special (Kenny Kosek, Andy Statman, etc), Yellin Grass (with his bluegrass banjo playing brother, Bob), Eastbound Freight and American Flyer (with Ben Freed). He is critically recognized as one of the best bluegrass singers to come out of the New York area. Clarence Ferrari has performed with countless musicians including Pete Seeger, Tom Chapin, Tom Paxton, Roswell Rudd, Davey Arthur of The Furies, Les Binks of Judas Priest, and The Brooklyn Philharmonic. 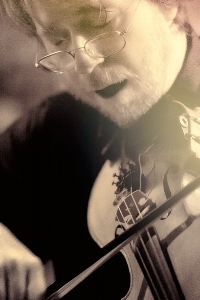 He has established his “fast and floating fiddle” to both Irish and bluegrass music. It's a pretty serious mistep by the present administration and a misuse of power in against the folks in Puerto Rico. Months after Hurricame Maria, 60% of the power has not been restored. Pretty sad response overall with food aid and medical supplies. This concert is to aid that effort. Come celebrate with us on the Lower East Side on Sunday, December 17th. It will be my last show for 2017, and it should be cracker. My very special guest will be none other than Safia Jama! She will be reading some of her recently published poems. The decorations are up, the Guinness will be flowing and I'll be performing some upbeat murder ballads with some new experimental tunings. Come early as it's a short 45 minute set and we'd love to see you there. Facebook: Check out who else is coming and invite yourself. Recently, for research on my new recording project about my colorful distant relative James 'the Rooster' Corcoran, I picked up the vinyl album, Joe and the Gabe, a collection of songs and tunes from Galway, I was taken by the sean nos (old style) singing of Joe Heaney. Having lived for many years near to his home-town of Carna in Galway myself, I was intrigued how he emerged out of this region, onto the stages of America and back again to bring Irish traditional music (500 songs) out to the world. 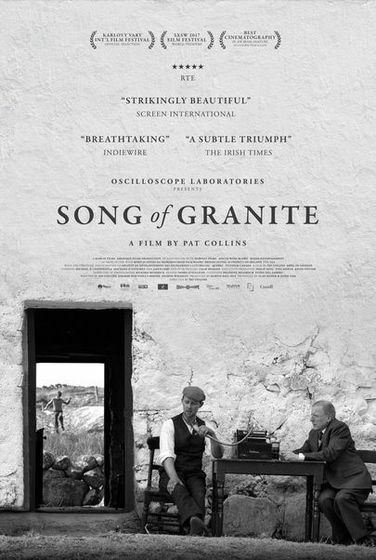 This movie (not a documentary) is a fascinating glimpse into the possible world he inhabited: Stark, uncompromising and as mysterious as any story that has emerged from the West of Ireland. Not your typical type of movie, but it is worth checking out over the holidays.